Yesterday, a friend of mine showed me a picture I needed to see. He was speaking of the challenges of a growing ministry he was leading. As he shared his heart for the future and his expanding role, he simply stated, “I don’t want the success of this ministry to become an idol.” My mind caught that image. I’m not sure what he said after that by way of explanation. All I knew was, I had a fixed image in my mind; one that I needed to see. I really don’t like writing on stuff like this. People that excuse ‘success’ usually aren’t experiencing it. This brother was, and he was aware that it’s all too easy for any success to become an idol. It is common to understand an idol as anything that takes the place of God; especially something material, something tangible that has no kin to anything spiritual. God calls us to love (read:serve) Him and one another. I know that. Can that ‘service’ become an idol? If my focus is on the ‘success’ of that service so much that I lose sight of God and His love and grace for me and others, perhaps I have an idol on my hands. I am all for success. I have no idea how it is defined, but I believe if God is in it, we ought to be in it to win it! Why do anything half-hearted or shabby? Why have the “Christian-discount” mentality when it comes to how we serve God? NO WAY. Serve Him with everything you have. Serve in love. Serve in humility. Serve with generosity. Serve with passion and excitement, vision and faith. 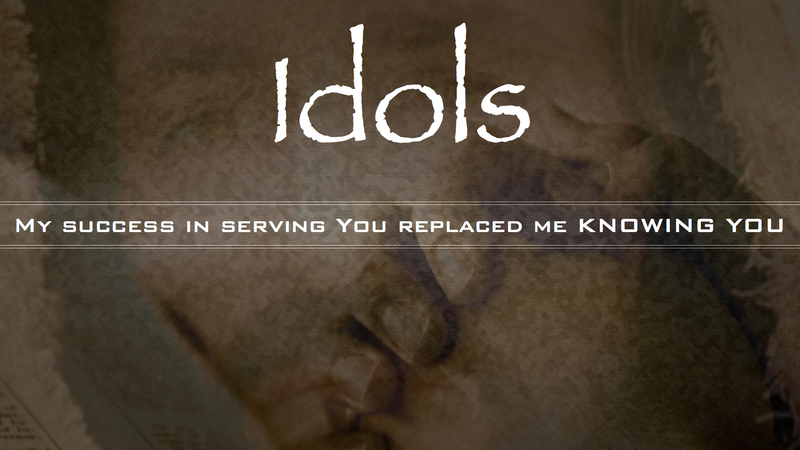 Just don’t make the results of your service an idol. God is God and He is in charge. Ask the Lord to protect you from the hidden idols that can somehow slip into a place of prominence. That I may know him and the power of his resurrection, and may share his sufferings, becoming like him in his death, 11 that by any means possible I may attain the resurrection from the dead. 12 Not that I have already obtained this or am already perfect, but I press on to make it my own, because Christ Jesus has made me his own. 13 Brothers, I do not consider that I have made it my own. But one thing I do: forgetting what lies behind and straining forward to what lies ahead, 14 I press on toward the goal for the prize of the upward call of God in Christ Jesus.